Professional system for slimming, antiageing and tightening for your business | perfecte'me. 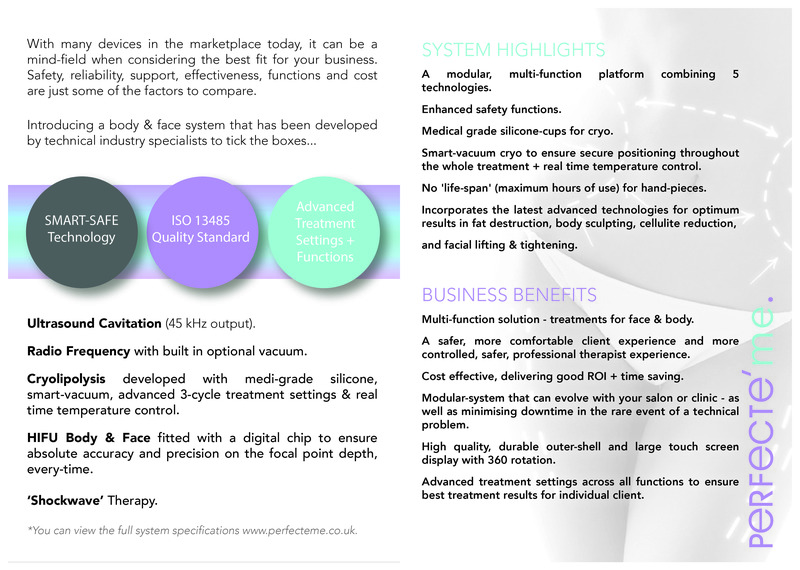 If you are considering investing in a professional, non surgical aesthetic body and face system for your business then look no further - you are looking at the perfecte'me system that delivers revenue and client results; effectively and safely. With many slimming and anti -ageing devices in the marketplace today it can be overwhelming when investing in the right one for your business. There are many factors to consider from the effectiveness of the treatments and results that are delivered right through to the safety and quality of the device - perfecte'me has been designed and manufactured with all of these factors in mind. As well as the standard of technology, components and internal system, there is a key stand out difference about the perfecte'me device. The system offers you a modular framework - this means each technology within the system is in fact its own 'module' or unit. The key benefit? Flexibility! You can choose to invest in some or all of the modules, depending on your requirements now and in the future. The modular design means that each individual technology or function is a separate element within the system that plugs in to the main frame - this being a big business benefit, as you can select the elements that your business wants or needs.
. Modular design - each of the five functions has a separate unit. • Enhanced safety functions make this one of the safest systems available. • Medical grade silicone-cups for cryolipolysis. • Industry leading smart vacuum to ensure cryolipolysis freeze hand pieces do not drop off during treatment. • Real time temperature gauge means that treatments can be delivered safely and effectively every time. • No life span for cavitation heads; unlike other machines in the industry that have a maximum use capability. • Incorporates the latest advanced technologies to provide the best results in fat distraction and both body sculpting and anti-ageing.
. Multi-function solution for your business with the ability to deliver a plethora of different treatments - including those for the face and body.• Solutions in targeted, permanent fat distraction and both body sculpting and anti-ageing. • Treatments delivered are the closest solutions available to your clients without the need for surgery or down time. • You will be able to provide packages and treatments for excess of £1,000 per hour - coupled with very low running and product costs. • Modular system that can evolve as your salon or clinic grows. • Advanced treatment settings across all functions to ensure class leading results for your clients. As well as all of the benefits that come with the perfecte'me system, we also offer our partner clinics full marketing support. We offer in-depth training on-location covering practical and theory - with supporting documents for your team to refer should they require when getting to know the functions. Additionally, we can tailor the training to your team - considering your therapists experiece levels. We also offer an optional marketing and consultation conversion sessions to assist you in maximising your ROI. We want you to succeed, and we'll help you to achieve that success.